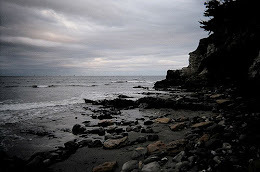 Living in California, it's easy to take for granted all of the amazing scenery and activities there are locally. Off of the coast of Ventura and Santa Barbara counties are a series of channel islands that make up the California Channel Islands National Park. 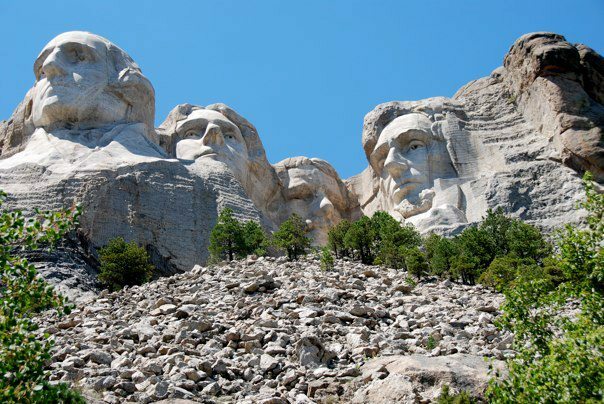 We look at them every time we drive up the coast, and we'd toured near them on some whale watching trips, but we'd never been out to visit them! SD came to visit California for work a few weeks ago, and we decided to do something we've been wanting to do for a long time - take a ferry out to the Channel Islands and have an adventure! Heading out for our adventure! After some research, we decided to book with Channel Islands Outfitters. 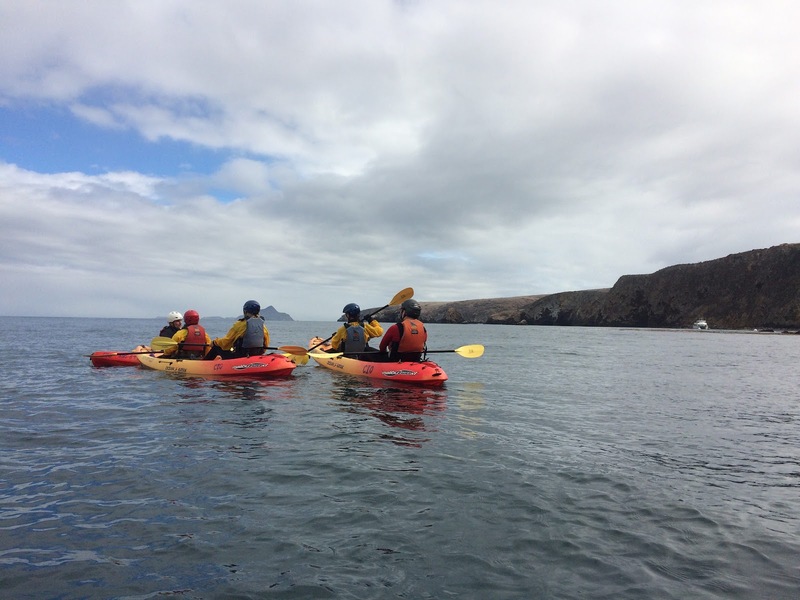 They offer a couple of different tours on Santa Cruz island, including kayaking, snorkeling, visiting sea caves, and camping! There are eight channel islands off the coast of California, including the most well known, Catalina. 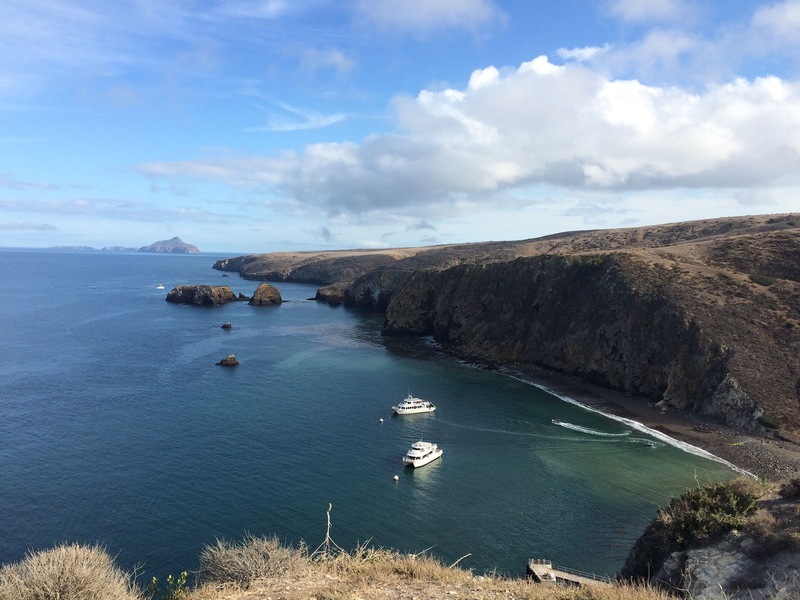 We were interested in visiting the Channel Islands National Park, which includes the islands of Anacapa, Santa Cruz, Santa Rosa, San Miguel and Santa Barbara. 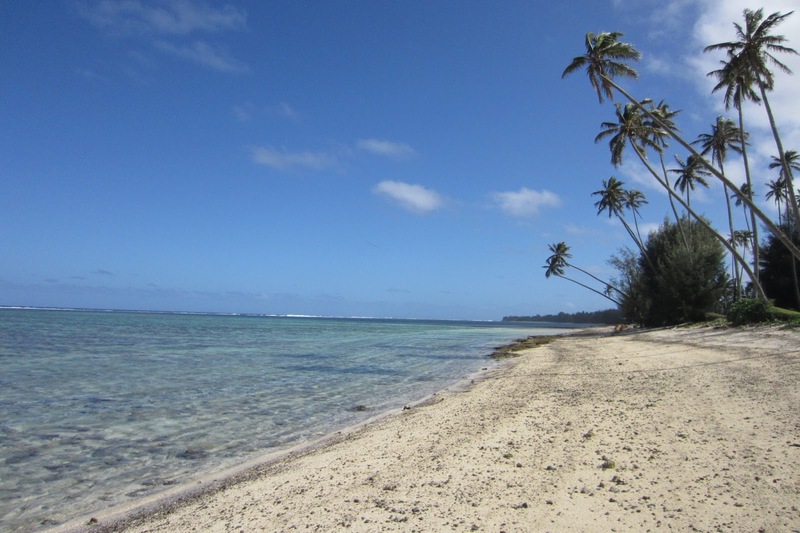 Visits can be made to several of the islands via ferry boat. We settled on visiting Santa Cruz island, where there is kayaking, snorkeling in the marine reserve, camping, and lots of hiking. 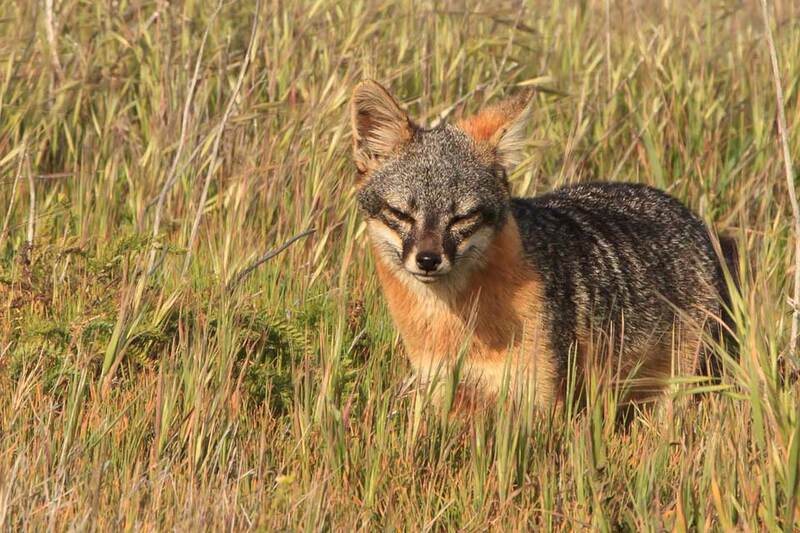 The island is also home to the Island Fox, which are seriously cute! 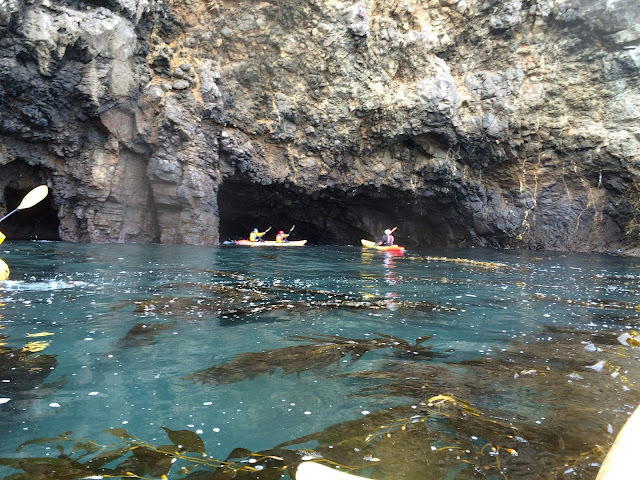 We decided to book a tour that focused primarily on kayaking in the sea caves on Santa Cruz island, so we reserved our spots on the Caves & Coves Classic tour. The Channel Islands Outfitters' website makes it very easy to understand what is included (the tour, wetsuits, lunch, equipment) and what isn't (the ferry to the island). You can book your ferry ticket through CIO or directly through the main ferry company for the channel islands, Island Packers. The tour we selected cost $144, and the ferry ticket was $59 for a round trip ticket. TRAVEL TIP: After you book with Channel Islands Outfitters, they send a very helpful list of items to bring with you for your tour. Listen to them! There's not much on the island, so it's super important to bring everything you need for the day with you. The things we found most useful were: a cold bag for our food, water shoes, water in a refillable bottle, sunscreen, a towel, a change of clothes (don't forget extra socks or a warm hoodie for when you get out of the water! ), a bag to put your wet suits in, and snacks. We added chocolate to the list, too! We arrived at the Island Packers ferry in Ventura Harbor and picked up our lunches from the Channel Islands Outfitters. We all wore our swimsuits under our clothes, as instructed, which definitely expedited getting into our wetsuits once we were on the island! The pier at Santa Cruz was damaged in a storm, so the ferry boats dock in the harbor and skift passengers to shore from there. It's very easy, but it slows down getting off the boat a tiny bit. Island Packers will typically offload the tour passengers first as to not cause any delays, which is a great feature. Lining up to launch our kayaks once we were all geared up! Once on the island, you get an intro talk to the kayaking, including info on how to get back in if the boat turns over, other safety tips and some general information on kayaking. The staff is very informative, helpful and friendly! 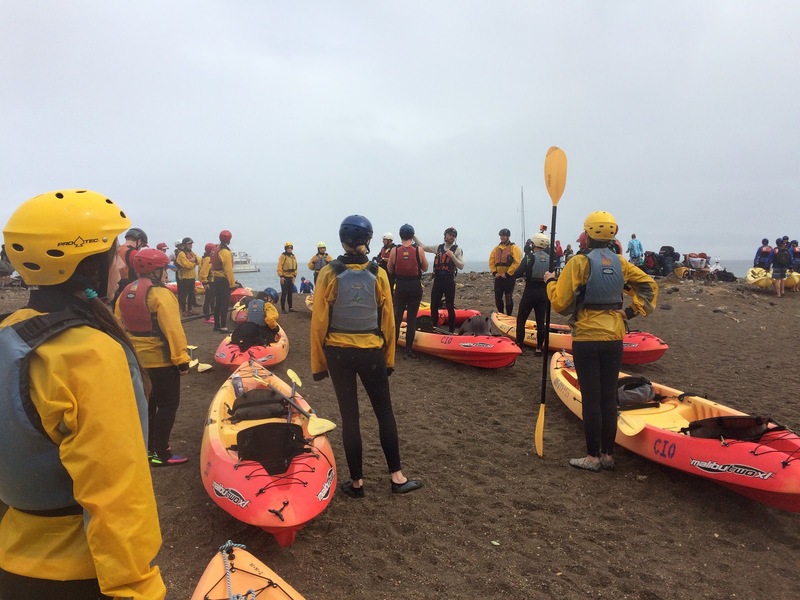 Then you gear up in wetsuits, jackets, life jackets and helmets, and you grab a kayak and are off! They have double kayaks as well as a couple single ones available - since we had an odd number of people in our group, I ended up sharing a kayak with MMS, while Hubby ended up in his own - an arrangement that worked out very well for all of us! 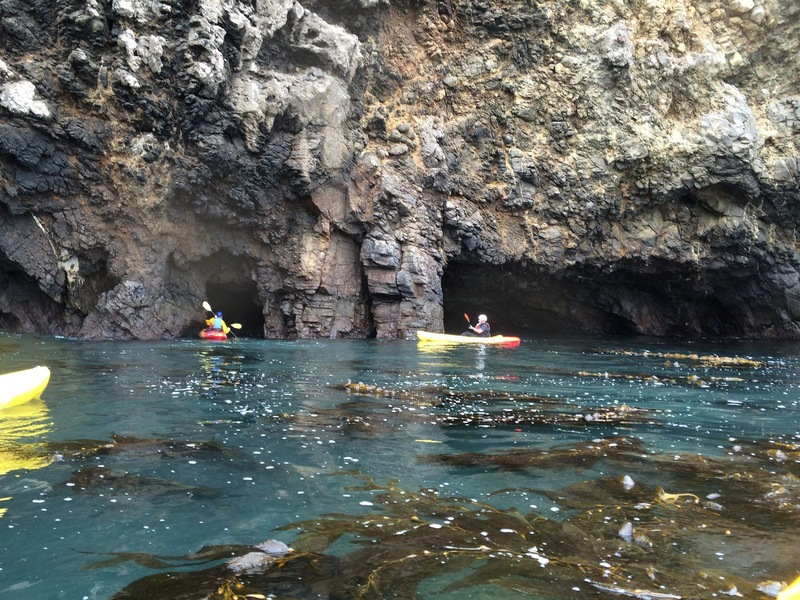 The day we went, there was a bit of swell, so we weren't able to go into that many caves, but Dave, our guide, was still great at pointing out wildlife (sea lions and seals), birds, and the awesome rock formations and kelp beds. Some of the caves are "pass through" ones and others you go in, turn around, and come back out - we only made it into two on our trip because of the water conditions. We kayaked for about 3 hours, naming sea lions as we went - it was incredibly fun and adventurous! One of the caves we scoped out but didn't go into. 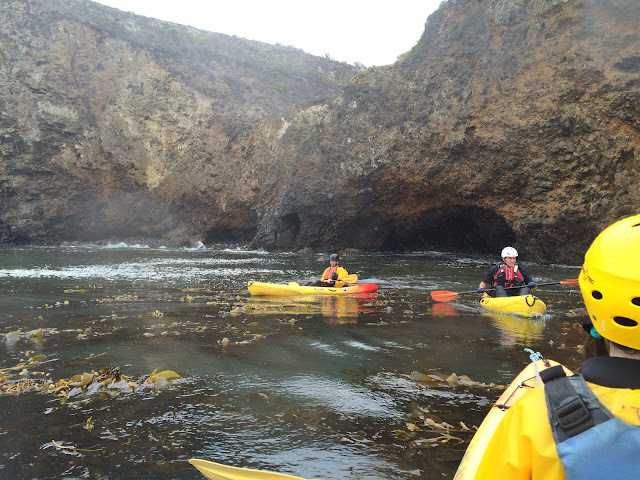 Right after this photo was taken, one of the kayaks in our group was capsized by a wave! 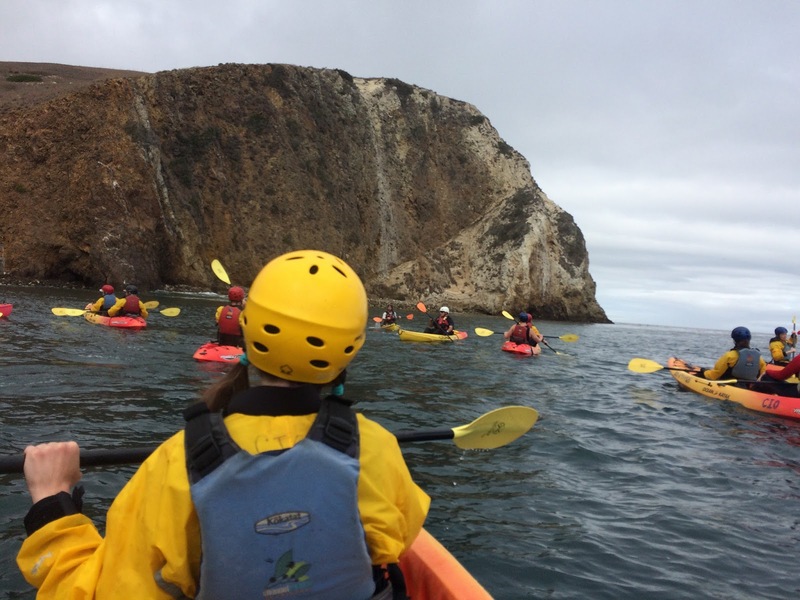 Fortunately, its passengers were experienced and comfortable with the ocean, so they were back in their kayak in no time! Gathering around our tour guide for a quick chat about the island. And back out the other side! 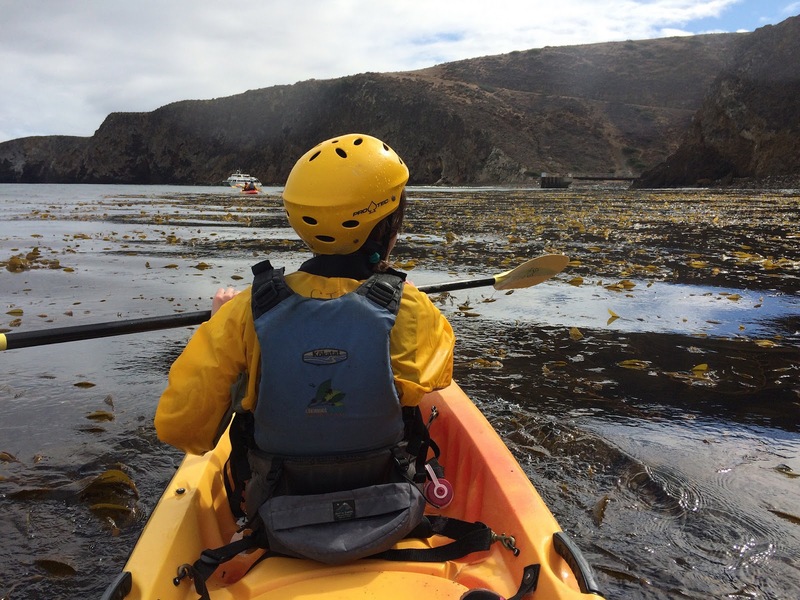 Heading back to Scorpion Cove through the kelp beds. When we got back to the island, we changed and had lunch - there's no running water on the island, but there are outhouse style bathrooms and CIO brings coolers of water to refill your bottles with. 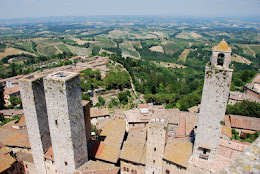 The lunches were amazing - I had a really delicious Italian meat and cheese salad, and my group all enjoyed their sandwiches and salads. The water was unfortunately too murky to snorkel in after lunch (though CIO also has heavier wetsuits and snorkel gear for you to use if the conditions are good), so instead we did a 45 minute loop hike to one of the island peaks and back down through the campground - it was a great way to stretch after kayaking all morning, and we saw a few island foxes along the way! View of Scorpion cove from the hike! You can do either the 8am or 9am ferry out to the island, and then the 4pm or 5pm ferry back. We did the 9am out and the 5pm back, and I wouldn't have cut it any shorter. 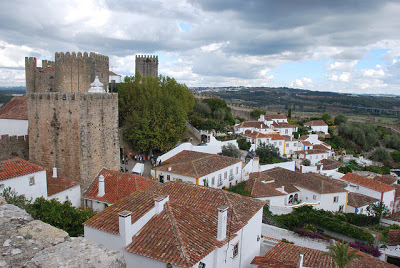 In fact, next time I go, I'll try to do the earlier ferry so I can have just a bit more time on the island! 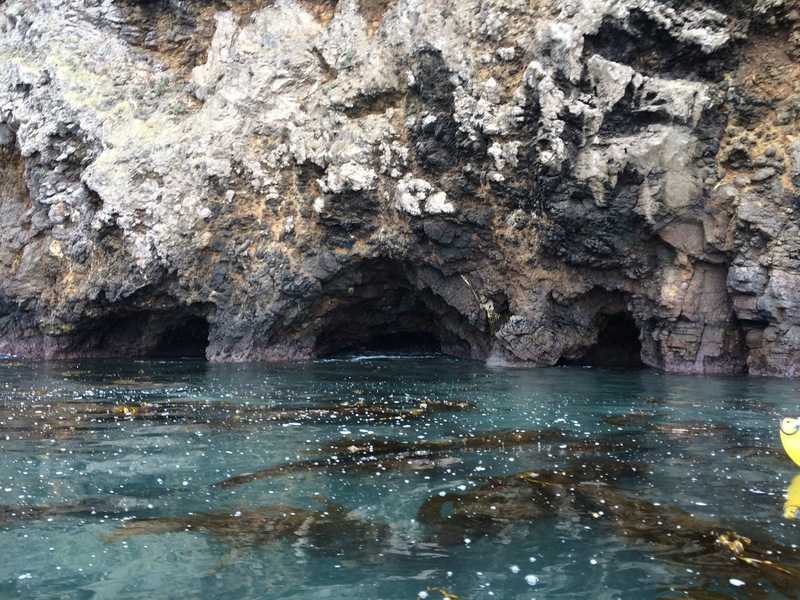 I have lived in CA my whole life and had not gone out to the Channel Islands before, and I'm now addicted! I'll definitely be going back out again.